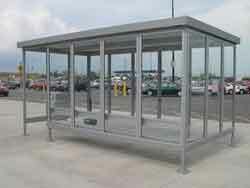 Bus Stop Shelter Installation & Sales. With the rising cost of fuel, and increased environmental concerns from all sides, more and more people are seeing public transportation as an important means of getting around. To embrace increased use of the system, it is becoming increasingly important to provide much better infrastructure systems to make using the service more pleasant. One of the main concerns that users often have is the lack of protectlion from the weather that they face while waiting for a bus, and this can largely be circumvented through the provision of bus stop shelters for the use of passengers while they are waiting. There are many things to consider when choosing the right bus stop shelters, and while many of these factors will be determined by the prevailing weather conditions in your area, others will necessarily come down to the budget available to you for providing the service. In order to encourage as many people as possible to take advantage of a public transport network, making the system as user friendly as possible is important. You need to consider the amount of time between services on a particular route, and make special consideration to other factors such as the way in which the service is presented. While a simple bus stop shelter that keeps the wind and rain off passengers while they are waiting is generally sufficient to ensure that passengers are not inconvenienced by the service, adding little extra features to the shelters will ensure that their overall experience of waiting for a bus is a positive one that does not put them off continuing to use the facility in the future. It is a sad fact of life that bus stop shelters are frequently abused by users, and are prone to vandalism, so choosing a model that is resistant to damage is essential. Shatterproof glass and a minimum amount of furniture will reduce costs through damage, while simply giving people a shelter that they can take some pride in will also reduce the amount of vandalism that is tolerated by the community. In terms of the seating provided within the shelter, it is important for this to be convenient and low maintenance. 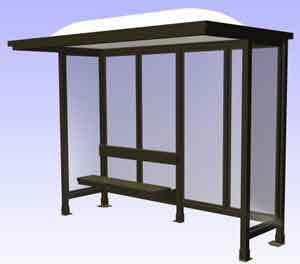 Bus stop shelter benches made of corrosion resistant aluminum are preferable to plastic, as they last longer, and despite the higher initial cost, offer a better long term solution to keeping passengers comfortable while they wait. 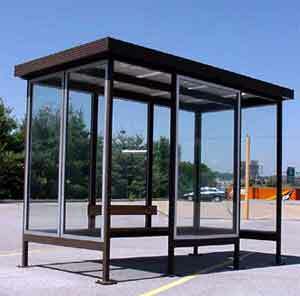 One of the latest innovations in bus stop shelter technology is the inclusion of solar power. During the day, batteries are charged up from the power of the sun, and then at night, this power is discharged through the top. It is a cost effective solution to providing illumination and making users feel more secure. Also, using solar powered illumination in the bus shelter means that there is no need to include connections to the local power service within the plan, and this reduces the cost of construction. Bust stop shelters come in either fully enclosed or open versions. While a shelter with a single side fully open to allow users easy access is friendlier, it does not provide complete protection from the weather, and if this is a concern in your area, then choose a model that has a small doorway style entrance as this gives better protection. As more and more people choose to use the bus, thanks to fuel costs and environmental concerns, making their journey more pleasant will encourage them to continue to do so, and will positively impact on the long term stability and sustainability of the system and its benefits.